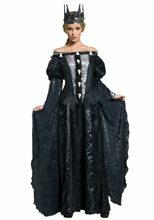 Queen Ravenna Adult Women Costume; Women's Costume Includes: Long black gown with silver trim, 3D molded skulls and attached sheer drape, and silver crown headpiece. 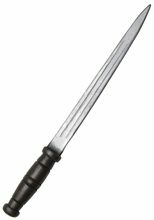 Snow White Dagger; Snow White's Warrior dagger. Silver tone straight blade with black handle. Molded latex dagger. 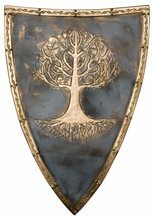 Movie costume replica dagger. Queen Ravenna Dagger; Curved blade with curved handle. Molded latex dagger. Movie costume replica dagger. 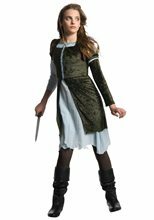 Snow White Tween Costume; Includes: the dark green and white dress with lace up detail at the front, puff shoulders and layered skirt detail. Matching leggings. And the leather look boot tops. 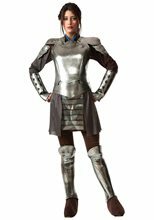 Snow White Armor Tween Costume; Available Size: Small (Fits most up to bust size 27", waist 24"); Medium (Fits most up to bust size 29", waist 27"). 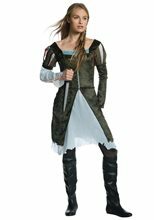 Snow White Adult Women Costume; Women's Costume Includes: dress, leggings and boot covers. Queen Ravenna Wig; Queen Ravenna's Wig from Snow White and The Huntsman Queen Ravenna's Wig for Adults/Teens. Short blonde bob style wig from the evil Queen Ravenna. Movie costume replica wig. The precious kingdom from the evil Queen Ravenna! 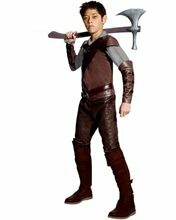 Snow White Armour Costume includes tunic, chest piece, shoulder piece, gauntlets and pants with attached boot tops.